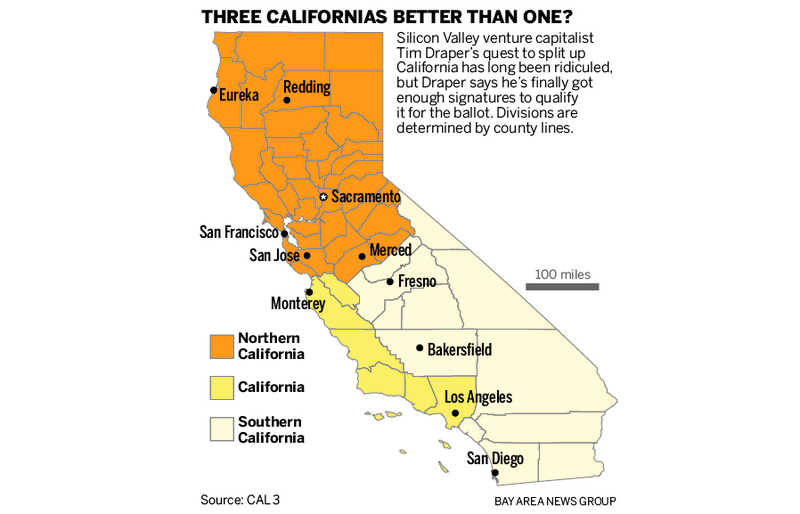 Last year, California venture capitalist Tim Draper announced a plan that would break California into three separate states. The Northern region of California would become North California, the Southern portion, South California, and a strip of land along the coast, including Los Angeles would be California. The idea was a solution to what many view as a currently ineffective and unrepresentative state government. Citizens of California feel that the elected officials of in their state government do not represent them. Many counties in California typically go Republican during presidential elections. However, because of the large concentration of Democrats in urban areas, the state reliably goes blue. This causes the state to favor policies that benefit those in urban areas, rather than those in the rural counties. Beyond failing to accurately represent and address their needs, however, the sheer size of California means that elected officials cannot quickly and effectively address issues that the public faces. This frustrates many citizens, who reason that a more localized government will better serve their needs. The first step to break California into three was to collect 365,880 signatures from registered voters in California. Tim Draper and his team collected 600,000, enough to place the issue on the ballot for the 2018 midterm election. On Wednesday however, Draper’s plan hit a snag, as the California Supreme Court wrote that “significant questions have been raised regarding the proposition’s validity.“ This unanimous decision directs the Secretary of State, Alex Padilla, to not place the proposition on the ballot. So, though they did collect enough signatures, the vote will not occur this fall. The dreams of Tim Draper and his supporters must wait at least another two years before they have a chance to become a reality. If you inquired to the average person on the street if they believe the government should or could be funded voluntarily, or if participation could be voluntary, the answer would likely be no. They would say involuntary taxation is a necessary evil, and it is in fact to the benefit of every individual to pay into the state. They would likely say without coercive taxation, everybody would be looking after themselves, and nobody would pay into police, fire, defense, roads, and other services currently monopolized by state. They may even think society would undoubtedly collapse under such circumstances. I understand why somebody would think like this, as any person alive today has forever lived under a strong centralized government, and may not be able to see through the smoke screens presented before them. This theory though, that government and taxation must be involuntary because it is to the benefit of the individual, flies in the face of praxeological reality and economic fact. A contradiction to this idea, the Law of Utility Maximization through cost benefit analysis Is one of the underlying functions of human action in the market. Utility maximization simply means every individual wishes to maximize the benefit they receive in exchange for every dollar, and for every moment of their time. Every consumer wishes to maximize the value they receive for the lowest cost. A rational individual will purchase a good or service if the benefit they receive from that service is equal to or outweighs the cost of purchasing it, as it is simply to their benefit to do so. The consumer wants to pay into a service if they value the benefit they would receive for paying into that service. And if there are many competing firms, the consumer will choose the firm which provides the best services at the lowest cost. This of course is the action on the part of the consumer which drives competition, and the success of the business that provides the best deal to customers. When a group has a coercively enforced monopoly it is no longer subject to competition. It no longer has to fight to provide the best services at the lowest cost to consumers, as it is not required to convince people to use their services. It no longer has the incentive to be efficient as it can be, it can just involuntarily take money out of the taxpayers pocket. This leads to what we now see as the horribly inefficient and wasteful services that the government provides. Since government services are not subject to the scrutiny of the market the people have no choice but to settle with the far below sub-par services it provides. If contribution to these programs were made voluntary, they would either need to seriously get their act together, or be severely outcompeted. Now if the horrendous services which government provides at the outrageous cost were really to the benefit of the individual, their simply would be no need for it to be involuntary. If it was voluntary, the consumer would want to pay in so they could receive the benefits. This is just like how a consumer purchases a ticket to a football game voluntarily because to them the benefit of the experience of seeing the game in person outweighs the cost of the ticket. Or, it is like how they voluntarily purchase food because being full is worth more benefit than the cost of the purchase. Are the most successful companies and service providers required to have a gun to the customers’ heads to get their money? Of course not, the consumer wants to give say, Apple, their money because they want to get the product. It’s the same logic for voluntarily funded emergency services for example. It is to the individuals benefit to pay a firm which provides emergency services as to most people, having emergency services at hand is worth the cost of not having it (the market would of course provide alternatives for those in dire circumstances who hasn’t already bought a service, like a 911 service which you call only to be billed after). Not only do we not need involuntarily funded group with a monopoly on the initiation of force at the center of our society in order to not divulge into a Hobbesian nightmare; but such an institution is always corrupt, inefficient and a scam on society. In conclusion, the myth of the justification and necessity of the state is a scam on a grand and colossal scale. The fact that government must be an involuntarily funded institution proves that it is a scam. The state acknowledges people would not value their services enough to voluntarily hand over the fruits of their labor. An involuntarily funded group based on the initiation of force, which of course cannot exist in a truly free society, is never justifiable nor is it necessary. After a century of major American involvement in world affairs, it’s safe to say that the U.S. Military has definitely deviated from what the founding fathers had intended it to be: A national defense force committed solely to protecting the American homeland, and on rare circumstances, lending a hand to allies in need. But after 250 years of mutating “policy”, what America has instead is an invasive, destabilizing, and extremely expensive attack force that has become a corrupt extension of our equally destructive government. Instead of focusing on defending America and its closest allies, the U.S. Military has completely destabilized regions worldwide, with the best examples being the Middle East and North Africa, and the developing Korean conflict. What started as an effort to combat proxy extensions of the Soviet Union ended up creating a worldwide terrorist organization and subsequent “War on Terror” that has destroyed or destabilized the greater part of the Middle Eastern region. It has resulted in the deaths or assassinations of several leaders and heads of state (and subsequent power vacuums), killing millions of civilians and soldiers, and costing trillions of dollars, and a bill that has been footed squarely by the American public. Most of the events in this chapter of US Military history were intended to “solve” the geopolitical mess that the U.S. Government directly intensified by directing the U.S. Military to distribute weapons equipment and training to insurgents in countries such as Afghanistan in the 1970s under the Reagan Administration. However, the fecklessness isn’t limited to actual combat and geopolitical failures. The military is also precariously inefficient, enabled by the lobbyists who have intertwined their companies with American communities, and by extension, the jobs that the families of those communities rely on. A prime example of this is in the years late, tens-of-billions over budget F-35 Joint Strike Fighter program. In 2006, the US Military began the F-35 JSF program, with the hope that it would eventually become the next-generation fighter of the future, replacing older, cold-war era jets, and work in tandem with current 4th generation aircraft, such as the F-22 Raptor. Even before the program got underway, there were doubts about the timelines and costs of this 5th generation fighter jet. However, as the project progressed, it quickly became crystal clear that the aircraft wouldn’t be anywhere near ready by the original deadline: due in part, to short-sighted forecasts that failed to account for delays, as well as the military industrial complex’s ‘build first, fix later’ mentality, which caused F-35 jets to have to constantly be sent back to the production factories any time a major design flaw was discovered, a process which was costly in terms of both time and funding. Another cause of delays was the massive amount of subcontractors and parts suppliers who were involved with the construction of all different parts of the aircraft, which caused significant logistical delays, especially when faulty parts or labor needed to be tracked down, or replacement parts remade. Instead of imposing tighter limits, cutting off funding, or making major adjustments to the program, the Pentagon, enabled by members of Congress (who were content to keep the funds flowing so long as the jobs they had promised to their constituents stayed put) kept funneling money into the program, akin to the way a gambler keeps withdrawing cash from the bank in hopes of finally winning, all the while fighting a losing battle. This inefficiency has also caused corruption and secrecy to become common tactics used to mask the flows of money and the inherent inefficiency of government bureaucracy. The most recent example of this occurred in 2015, when a report by the Defense Business Board (DBB), a federal advisory panel of corporate executives, and consultants, found that the Pentagon was operating extremely inefficiently. A whopping 23% of its total $580 Billion budget being spent not on equipment, or on troop-related costs, but on overhead, back-office bureaucracy operations. Its total labor pool (1.01M) rivaled the total number of active troops (1.3M), which is at a level not seen since 1940. Almost half of those back-office personnel — a whopping 457,000 full-time employees — were assigned to logistics or supply-chain jobs, which on its own exceeds the size of United Parcel Service’s (UPS) total global workforce. The DBB report detailed methods and reforms by which the Pentagon could save $125 Billion over a five year period, not by resorting to layoffs of civil servants or reductions in military personnel, but by utilizing methods such as renegotiating contracts, cutting out high-priced contractors, hiring less expensive workers, and making better use of data analytics. However, the report was quickly censored, details classified and documents removed from the Pentagon’s website soon after their release, because Pentagon officials feared that if Congress and the White House were to see the detailed DBB report, it would heavily undermine their public narrative that the Pentagon was cash-strapped and in need of additional funds to furnish soldiers with necessary equipment. According to the Washington Post, the details of the report were never intended to be seen by the American people from the very beginning, because “a $2.9 million consulting contract signed by the Pentagon stipulated that none of the data or analysis could be released to the news media or the public” (Whitlock, Woodward). According to the same WaPo article, attempts to analyze the information in databases that tracked both civilian and military personnel, as well as labor and contractor costs, were stymied by “the armed forces and a multitude of defense agencies”, many of whom “had fought to hide the data from outsiders and bureaucratic rivals, according to documents and interviews”. But the infighting and secrecy didn’t end there — “Information on contractor labor, in particular, was so cloaked in mystery that McKinsey described it as ‘dark matter’”. Several times, Deputy Secretary Work himself had to step in, in order to allow the Defense Business Board to access the information it needed for the analysis, with disorganization being so rampant that “at one point, more than 100 people were feeding data from different sectors of the bureaucracy”. The Pentagon has since implemented very few of the highlighted reforms, instead opting to implement reforms that had already been planned, as well as other unrelated changes. It has also changed its attitude towards the report, with Deputy Defense Secretary Robert O. Work, one of the officials who oversaw the report, doing a sudden 180 on his previous advocacies of the reforms and claiming that the $125 Billion in savings is “unrealistic”. This recent incident isn’t the only attempt to enact significant change. Notable pushes by defense secretaries from 1997, 2010, and 2013 all dissipated after the reform instigators left office. A quote from Dov Zakheim, former comptroller under President George W. Bush, sums up the main cause of the inability of Pentagon reform-seekers to enact change: “Because we turn over our secretaries and deputy secretaries so often, the bureaucracy just waits things out. You can’t do it at the tail end of an administration. It’s not going to work. Either you leave the starting block with a very clear program, or you’re not going to get it done.” Overall, this is just another example of the extreme incompetence and obstruction that Pentagon bureaucrats impose on necessary change. In addition to its numerous geopolitical failures, the Pentagon has also resisted several notable efforts to update manned equipment with next-generation automation, in favor of the old ways of the military-industrial complex. This was recently seen when the effort to introduce pilotless, jet-powered, aircraft carrier-capable drones, such as Boeing’s X-45, and Northrop Grumman’s X-47, both of which were part of the UCLASS (Unmanned Carrier-Launched Strike & Surveillance aircraft) killer stealth drone program, failed, when the Pentagon abruptly decided to end the program in 2017. The Pentagon’s decision was reflected in the its defense proposal budget for 2017, which after showing a combined $818 million allocated for the project in 2015 and 2016, disappeared completely for the fiscal year 2017, replaced partially by a program to develop mid-air refueling aimed at supplementing current piloted attack aircraft that would receive a fraction of the funding. This occurred amid reluctance from military bureaucrats over the absence of the human element; the robot warplanes posed a clear threat to the pilot-centric cultures of the Air Force and the Navy’s aviation arm. The UCLASS project almost became reality a decade ago, in 2006, but was sidelined by similar anti-A.I. sentiment and an overwhelming preference for manned aircraft. After the recent dismissal of the program, a Boeing engineer who was involved with the project (but who desired to remain anonymous for obvious reasons), criticized the military holdouts over their illogical and counterproductive loyalty to manned aircraft, remarking that “the reason that was given [for the ending of the UCLASS program] was that we were expected to be too good in key areas and that we would have caused disruption to the efforts to ‘keep F-22 but moreover JSF sold,” the engineer said. “If we had flown and things like survivability had been assessed and Congress had gotten a hold of the data, JSF would have been in trouble”” (Axe). This refusal to eliminate the human element from welfare could possibly place US airpower at a disadvantage in the future, with competitors not far behind, and the current F-35 program facing significant hiccups and disadvantages to programs such as UCLASS, which is billed as (and which has demonstrated the capacity to become) a replacement to the concept of manned attack aircraft altogether. One such advantage over the F-35 that the UCLASS drones have is that since they require no pilot (who subsequently needs regular training to keep his skills in top condition), but instead rely on simulation and training programs combined with the occasional training sortie, they can be kept in storage until needed in a conflict, and occasionally updated as needed, eliminating many billions of dollars per year in training costs, wages, fuel and maintenance costs. What is the point of detailing these issues? The corruption and short-sightedness that has plagued the military for years have sidelined our nation with unnecessary war, criminal levels of inefficiency, and a lack of advancement to match the global military market and its next-generation aspirations. The American military behemoth has destabilized entire regions, resulted in the deaths of millions and indoctrinated the vast majority of the American people to believe in blind support of the military, all in the name of “patriotism”. But what we have today is hardly something to be proud of. The solution? Revolutionize the US military by implementing major logistical and managerial overhauls, and increasing military accountability and transparency by making the military completely dependent on its “shareholders”: the American people. They would voluntarily fund the defense-only force, transitioning the current active forces to a need-based defense force which would operate from its current facilities on American soil. The new system would also eliminate the current power structure that rewards officials who are older with more power, (which promotes corruption and an aversion to change) and instead replace it with a distinct state/regional system in which the people of a certain area would be able to vote at certain intervals on which management methods and defense packages that they would prefer. In contrast to the current system that runs on virtually endless government funding (and which violates libertarian principles of voluntaryism), the new system would allow communities to see where their money goes inside the military and would allow the people to effectively control unsavory military behavior by cutting off funding. This “military 2.0” would also eliminate the need for much of the military budget, and would also eliminate the need for the multitude of (sometimes fraudulent and greedy) contractors that currently supplement military manpower and equipment needs. This includes the likes of Blackwater and other controversial private military companies, several of whom have committed atrocities abroad (A prime example being the 2007 Nisour Square Massacre in Iraq, in which a group of power-drunk Blackwater guards cruelly gunned down 14 civilians and later claimed to have been attacked by insurgents), which reflects poorly on the image of the United States in those countries. The smaller defense force would allow for a stronger community connection between military forces and the people they serve. Most importantly, this military 2.0 would eliminate the tragic loss of life that has been a heartbreaking side effect of the Middle Eastern wars and American imperialism as a whole. This proposal is a clear step away from the corrupt imperialistic military that America has had since the late 20th century and a step towards a streamlined, transparent, and efficient self defense-focused military that all Americans can have a say in, and which all Americans can be proud to support. It is a change that is very much needed, given the current corruption, inefficiency, and deception that plagues our military’s bureaucracy. But it is also a proposal that will need the full effort of the people, given the heavy resistance that has doomed past efforts. Whether or not reform is implemented is up to the American people. Let’s hope the American people make the right choice. Apuzzo, Matt. “Ex-Blackwater Guards Given Long Terms for Killing Iraqis.” The New York Times, The New York Times, 13 Apr. 2015, www.nytimes.com/2015/04/14/us/ex-blackwater-guards-sentenced-to-prison-in-2007-killings-of-iraqi-civilians.html. Axe, David. “Pentagon Kills Its Killer Drone Fleet.” The Daily Beast, The Daily Beast Company, 11 Feb. 2016, www.thedailybeast.com/pentagon-kills-its-killer-drone-fleet. Whitlock, Craig, and Bob Woodward. “Pentagon Buries Evidence of $125 Billion in Bureaucratic Waste.” The Washington Post, WP Company, 5 Dec. 2016, www.washingtonpost.com/investigations/pentagon-buries-evidence-of-125-billion-in-bureaucratic-waste/2016/12/05/e0668c76-9af6-11e6-a0ed-ab0774c1eaa5_story.html?utm_term=.398653bc33c4.